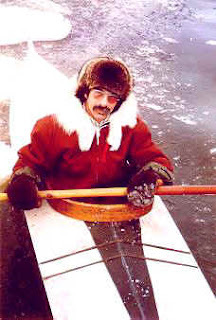 David Zimmerly was one of the early researchers in the field of kayaks and surveyed a whole bunch of them. His research is summarized in his book Qajaq. Zimmerly also has a website with a whole lot of information. The link will take you directly to the page that has a whole bunch of drawings of kayaks in pdf format. Zimmerly also wrote a how-to book on the topic of the Hooper Bay Kayak and a number of articles for kayaking magazines. All in all a prime resource for the traditional-kayak builder. It was off Zimmerly's drawings that I built my first baidarka. talk about a dream job that guy had! How's the toxic cleanup coming?